This teaching and learning kit includes materials and lessons for a Common Core-aligned, high school language arts course with research-based strategies to support English Language Learners. 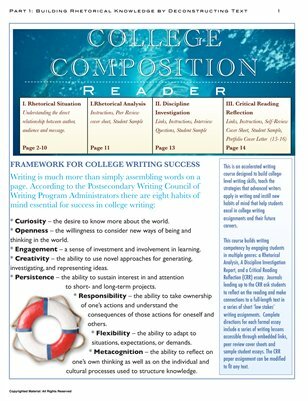 Includes three complete customizable essay assignments with corresponding peer review cover sheets, CC Video lessons, links and directions sequenced to build generative writing and research skills. Final essay assignment, the Critical Reading Reflection, can be used with Mike Rose's Lives on the Boundary, or any instructor selected text. Materials are available via Dropbox and can be modified to fit individual courses. Course content aligns with Language Arts Common Core and is appropriate for 11th/12th grade and/or AP English as well as Freshman Composition.